Join us for Pool Sessions on Friday nights, 6:30 - 8:30 at Elevation Place. We have pool sessions most fridays, usually no pool session on long weekends. We rent the pool so Elevation Place admission is not required. If you are bringing your own boat, come to the rear pool door. No boats in the change room please! Two passes will be available this year for members. An annual pass or a 90 day pass. Adult, youth (u-18) and family rates are available. Annual - This pass will enable you (individual pass) and your family (family pass) to attend all pool sessions (Jan. 12 to Dec. 14th) for a flat rate. You must be a member to receive this pricing. 90 day pass - This pass will enable you (individual pass) and your family (family pass) to attend all pool sessions for 90 days after the purchase date for a flat rate. You must be a member to receive this pricing. Join us at Elevation Place in Canmore for our pool session on Friday nights. The 2 hour pool sessions are a great place to work on your roll and paddling skills in warm water. Club members will be present to help beginners with wet exits and you can request instruction (subject to availability) to get started or for advanced skill development. All gear is provided for the pool sessions. You are also welcome to bring your own equipment. We recommend you bring a nose plug! Rolling instruction is available some pool sessions from our certified instructors. Roll sessions are your opportunity to receive help on rolling or paddle strokes / playboat drills, etc. Rolling instruction subject to instructor availability. 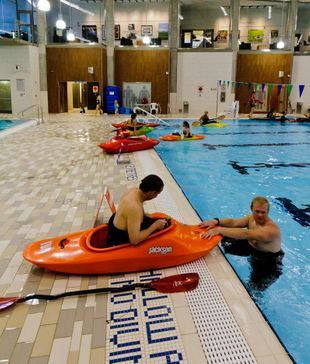 Please email info@kanpaddle.ca in advance to arrange your training or inquire at the pool side. For 2019, we have scheduled a number of clinics throughout the season. Please see our calendar for details and to register! Kayak polo games are known to have broken out with "Shinny-like" rules - all skill levels playing the same game. Intensity depends upon the participants - beginners absolutely welcome.